I’m here with David, photographer and skater. Hello, first of all tell us something about you! I’m gonna graduating in mechanical engineering, I’m also working in a company that produces plastic and I dedicate all my free time to photography or on Google maps to find avenues to sk8. Ah, you keep yourself really busy! Do you play any sport? I “practiced”… neck pain keep me more behind the camera than on a board. However I practice bodyboard from the early 90’s, I practiced aggressive inline and now I play longboard since 2009. Behind the lenses what do you catch? I did photograph of surfing and mountain board, now I’m focused in longskate. Why did you choose this sport to shoot? What impresses you the most? When I started in 2009 this sport was virtually unknown in Italy, and as I usually do, I always carried with me my camera. At first I did not have very clear what I was doing throwing myself down by the Tuscan hills, but gradually I began to meet people who practiced it meeting them on Facebook and by going to events. This sport is now in a boom period, so I decide to start documenting as much as possible, starting with the Italian scene. Enjoying this sports what spots have you visited? Which have “hit your heart”? I was lucky enough to see a lot of Italian places in the past three years: I visited the south of Sardinia with Fabrizio Ara, I’ve explored the Basilicata with my friend and mentor Elisha Mattioli and with Dario Nincheri, I’ve seen some spot in Friuli this summer with Extremepasta, I’ve been lulled by the gentle hills with the Sborello Team, I visited the beauty of Trentino thanks to Fabiano Ferretti, I was leaded by Gipsy Team to find awesome places. It’s really hard to tell you what It’s lefted in my heart, I can tell you that the company has always been excellent, the streets were breathtaking and every trip has left me something. Well, you have surely a lot of memories to take with you. Now tell something ’bout your next future plans? I’m waiting for the 3rd edition of Back to the temple in Gloria, organized by Land Rockets – the coolest slide jam in the area – and the fourth (if I correctly remember) Volpara edition, which is a basic freeride with good music and streams of beer. 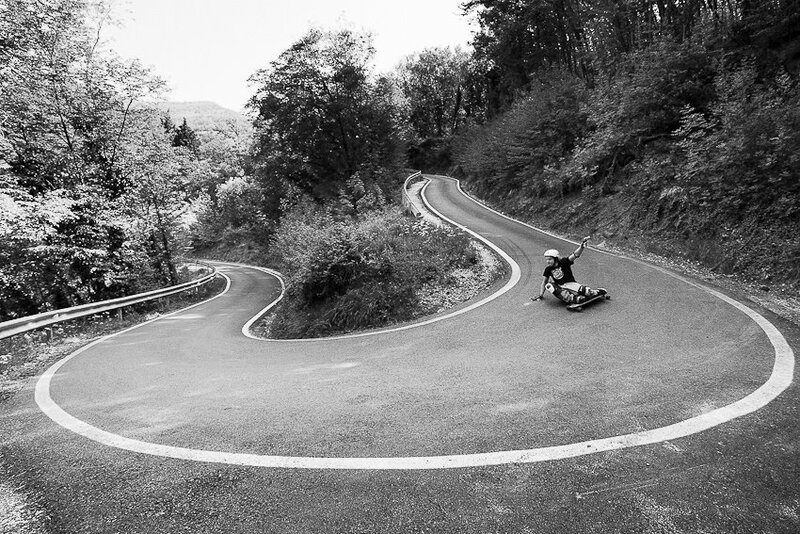 I have a couple of “secret” projects… I can tell you that I’m planning various skatetrip in south Italy. Italy is famous for its alpine passes but from Florence to south and the isles there are stunning places that are just waiting us. Talking ‘bou videomaking I’d like to get into this world with a documentary that portrays the Italian scene, but unfortunately the problem is to find brands interested in sponsoring. The petroil to get around Italy costs a lot… and my funds are very limited. We hope you will find them soon, we’d like to watch your docu! I thank you for the chitchat and I wish you good luck, from me and the 4Storm. Dajeforte and stay action!